The pilot episode of The Adventures of Superman stands as one of the great episodes of ’50s TV. It has been an interesting week, again! I had a nightmare and fell out of bed, striking my forehead against a night stand and opening a cut up. It bled badly and was still oozing two hours later. So, I took myself to the Emergency Room where I got my cut superglued shut and a tetanus shot. I already had a headache and some aching muscles from the fall. And an embarrassed feeling in having to explain what happened. The only good takeaway is that I now have a miniature Harry Potter lightning bolt scar just above my right eyebrow. Oh, and two of my friends got not-good health reports this week. Another peripheral acquaintance recently lost her mother, her one true love and her business. She took her life this last weekend. So I needed something to make me feel better. 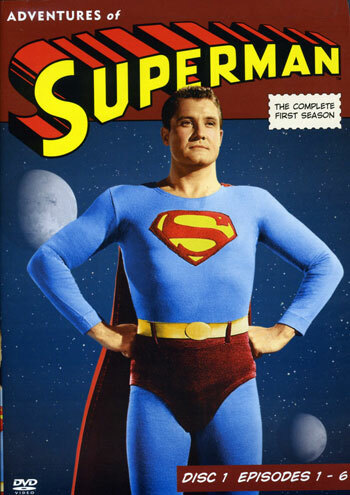 Staying at home to rest my head and back, I decided to watch the premiere episode of The Adventures of Superman starring George Reeves. “Superman on Earth” is one of my favorite episodes of ‘50s TV. The 28-minute episode is also one of the best TV superhero origin stories that stays true to its source materials. It begins on Krypton where the weather has been odd. The high council has asked young scientist Jor-El (Robert Robinson, best known as Mr. Boynton on Our Miss Brooks). He says Krypton is being drawn into the sun and will soon explode, but the council laughs him out of the chambers. At his home, he fuels his experimental rocket and discusses his experience with his wife Lara (Aline Towne, who made some memorable appearances in Republic serials). The planet’s weather anomalies begin to intensify, and Jor-El feels that it will soon explode. His rocket can carry one and he offers the seat to her. Instead, she elects to stay with him and send off their small son. The planet explodes, the rocket speeds away, finding its way to Earth where it crashes in a field near Eben and Sarah Kent (Tom Fadden and Frances Morris). I love how they used the original names associated with the Clark Kent story and the Superman novel I reviewed some time ago. The story unfolds normally, with Clark Kent growing up, Eben dying and Clark going off to join the Daily Planet. Here we meet the cast that the Adventures of Superman made famous. George Reeves as Superman, Phyllis Coates as Lois Lane, Jack Larson as Jimmy Olsen and John Hamilton as Perry White are all there in their glory. We also get a glimpse of the slight innuendo and wordplay between Lois and Clark that would characterize all Superman stories for the next 65 years. Following this episode, I was much more calm and relaxed and decided to watch the Superman vs. The Mole Men movie made the year before. Suddenly, I was six again and living in Richmond, Virginia, watching Superman on an old black-and-white TV. The feeling of nostalgia and all around goodness made the day pass by. Life was … better. It still wasn’t good. Just better. I finished the morning watching the end of The Cat People, coming in near the swimming pool scene. It was gloriously noir. All in all, it was a mixed bag of a day. I need to go read something uplifting too.